A little while ago we’ve received a book named Natasha Mehra Must Die penned by Anand Sivakumaran published by Fingerprint Publishing!. The book title itself is an indicator of the book belongs to the crime thriller genre. Does this book meet our expectations? Is it a thriller worth going for? Well, the short answer is, yes. From our team, I got a chance to read this book and here is my personal and unbiased review of the book. Let us take a look at the book cover. Our regular readers are familiar with our team’s beliefs about the book cover. We, all of our team members, believe that a book must not be judged by its cover only. At the same time, we also believe that a book cover makes a strong influence on book reading and/or book purchase decisions. The book title is “Natasha Mera Must Die” and on the cover page, you see a collage of photographs. Passport size photographs of ladies of different age groups cover the majority of the book cover. It may raise a thought that the cover page doesn’t go in sync with the book title. But, after reading the book (or reaching around mid-way in the book) you got to know that the cover page is not only well thought, but it goes in sync with the story also. So, don’t think that the book title is in singular form and the cover page shows multiple persons on it. The black and white color scheme with the red blood spots reflect the theme of the storyline, and the cover designers must get a bonus point for the same. The plot, in the beginning, look very confusing and you may think that the author missed the track of the details and what you’ve read in the previous chapter(s) doesn’t connect with the current chapter. Eventually, you will discover that the prime characters focused on in various chapters have just the same name, but they are different persons! 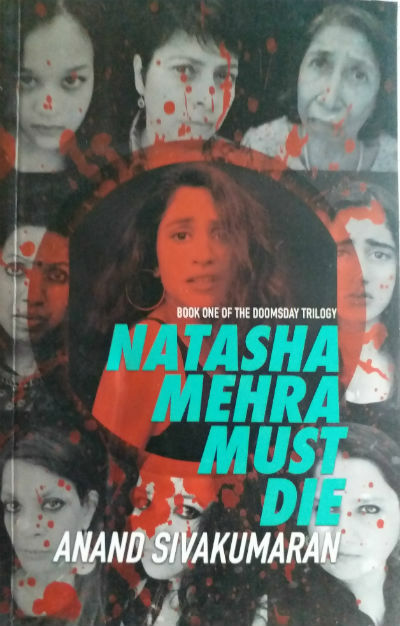 Yes, Natasha Mehra must die, talks about many Natasha Mehra, not a single one! Since a few days, not only in Mumbai city or just in India, a group of assassins is on a killing spree where their target is a female (age doesn’t matter) named Natasha Mehra. And the assassins don’t care about the collateral damage. It seems that they wanted to wipe out the existence of every Natasha Mehra from the planet! One Natasha, a young girl, is able to connect these murders with each other and suspects that somehow the life of every Natasha Mehra is in danger! But, what can a single young girl do to stop it? Or how can she even prove her theory? It might be a mere coincidence! So, she decided to approach one of her nemesis who is a celebrity news reporter and thus an influential figure, popularly known as NM. But will Natasha Mehra be able to convince NM about her theory? Will they unite? Will they be able to save any other Natasha Mehra, including themselves, from being killed? Well, you need to read the book to get answers :). And over the course, you meet, Natasha (7 years) to Natasha (27 years) to Natasha (72 years), Inspector Qadir Ansari, Appu, Paramvir Dahiya, Aryan Khosla, Nikki, Kabir Siddiqui, Chandra, The Kul… and others. Natasha Mehra Must Die is a crime thriller which requires your attention while reading, especially the first half. The book than follows the famous Dan Brown path. Yes, in the second half you will find the links are connected in the mythological aspects. Well, I cannot reveal more, as it will contain spoilers otherwise, which I like to avoid as far as possible. This is the first book by Anand Sivakumaran, and it shouts that the author is here to stay. The author infused humor, especially one-liners and sarcasm, quite intelligently in the book. And he has done it so crisply that you get comic relief during tensed situations and will often feel you are watching a quality James Bond movie. The readers, especially the younger ones, will find it more connecting. Of course, the presence of slang and cuss words is there and thus the book cannot be referred to kids. Even the readers who are not comfortable with such readings will also like to stay away from it. But, for most of the mature readers, who enjoy typical masala thrillers, there might be nothing to complain in this regards. The beginning of the book and the references to the shootout at a school by a depressed shooter reminded me of – The Sane Psychopath – a recently released psychological thriller by Salil Desai. The central thought of the book, the reason for the killing spree, especially how it is explained in the book, is half-baked and I didn’t find it very convincing. At the same time, I like the way the characters are developed, the way the current happenings and the real world environment, especially the way of living is explored in the book. The author is good at linguistics also. This book has many punchlines and quotable passages in the story spread over 20 chapters including a few Interludes and 2 Epilogues. Let me share an example, where the author elaborates a characteristic of one of the prime characters, through her mental state in a rather tough situation. It would be easy to just crumble down, to let sleep take over. But no, she couldn’t give up. She had never given up in her life. I also like the realistic representation of one of the Natasha Mehra who hated her name cause she was called Nuts (among many other names). What happened to her when she blindly trusted Alok and how it affected her life that point forward will remind you of ragging and the adverse effects, talked a lot earlier. Same way, when a person is not getting his/her due, he/she feels it strongly. Anand explored such feelings through simple yet effective lines in the book. … But cursed with a nickname that led to all her accomplishments being viewed with derision rather than admiration, she who by rights should have been the heroine of the pack, ended up as the Joker. When you have Mumbai as the canvas of the book then how can you avoid mentioning local train journey? The way the author explores it, especially about women’s only compartment, is straight out of real life. But just when we firmly decide on something and set ourselves on what we think in irrevocable course of action, fate loves to spite us by ensuring that we do exactly the thing we have done mother-father swear on to never do. She hated feeling like a victim and self-pity was an indulgence she just wouldn’t allow herself. Hence, before her lachrymal glands could do a Niagra, she had blinked the tears back. Only trouble is that when one tries so hard not to think of something, capriciously the mind puts all its energies into only summoning up thoughts pertaining to the taboo subject. Under normal circumstances, chances are that sane individual would be thinking about a pink elephant dressed in a yellow tutu, pirouetting daintily. But try telling yourself not to think about the same and instantly one’s consciousness is assailed by images of the prancing, pink pachyderm. But culpability and inevitability didn’t mean that it didn’t hurt. Perhaps it is true that in times of real need, all hi-techness goes out of the window and the old ways turn out to be the best. The directory rewarded Natasha, for the ache in her arms and the dust in her nostrils, with three addresses. I also like the way the author builds the character of Appu. Especially, the mention of her upbringing and her psyche. Only a master storyteller can explore a conflicting character whose professional skills (and duties expected from her) are quite in contrast to her love for doing something unexpected. Apart from the protagonist, this is the most challenging character to build and the author did it convincingly. It is not an out and out suspense thriller, as the identity of the killer is exposed quite early in the book. Actually, once the identity of the killer is exposed it becomes a challenge to for the author to keep the reader glued. The book ends in a way (and the title also suggests the same) that you can expect the sequel of the same. Overall a good thriller which has its own letdowns as well. However, a mature thriller lover will find much more positives in it. Definitely worth going for. Around 7 to 7.5 from 10 stars.